The chart above shows the one year average sale price changes (all up for these zip codes) by city and zip code for the sales period of Quarter-2 of 2011 through Quarter-2 of 2012 and for zip codes with 500 or more sales during the year. Rancho Mirage and Indian Wells are not listed as there were not over 500 sales in each of those smaller zip code segments. Looking at average sale prices for this one year period of time gives us a general idea of what the market is doing, but for each buyer and seller we need to focus on their specific community, price segment and inventory situation. At Sheri Dettman & Associates, one of our goals is to provide our clients with as much information as possible knowing that informed clients generally get a better price whether buying or selling a property. 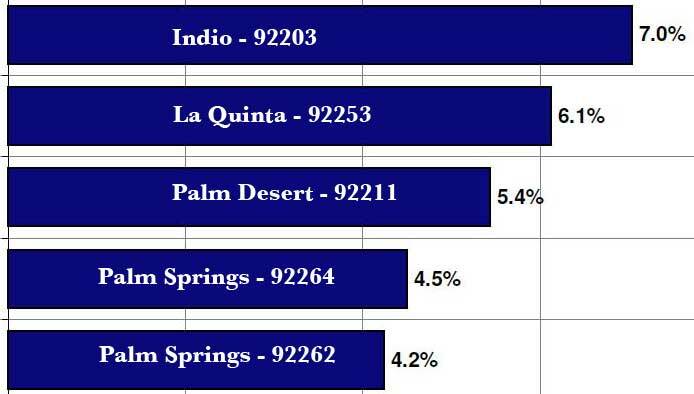 Data Source: Desert Area MLS for zip codes with 500 or more homes sold for the period. Information presented here s deemed to be correct but is not guaranteed.